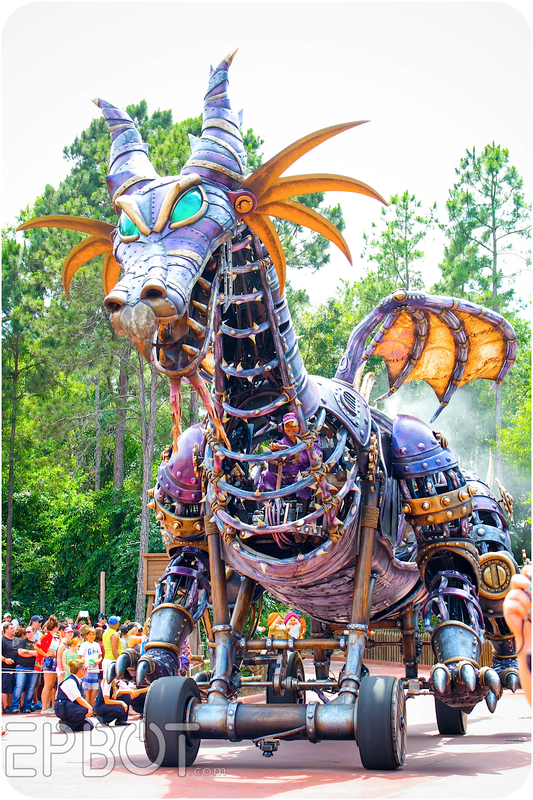 Ok, time for the best part of the new Festival parade at WDW: the giant fire-breathing steampunk dragon!! 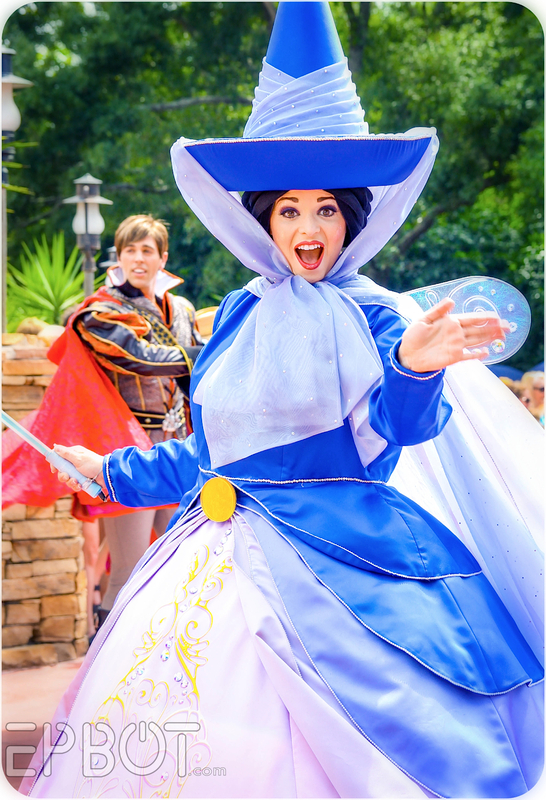 Flora, Fauna, and Merryweather come gliding out on special Segways hidden under their skirts. I love their new costumes; the cascading ombré effect is just lovely. Plus, check out those hats! 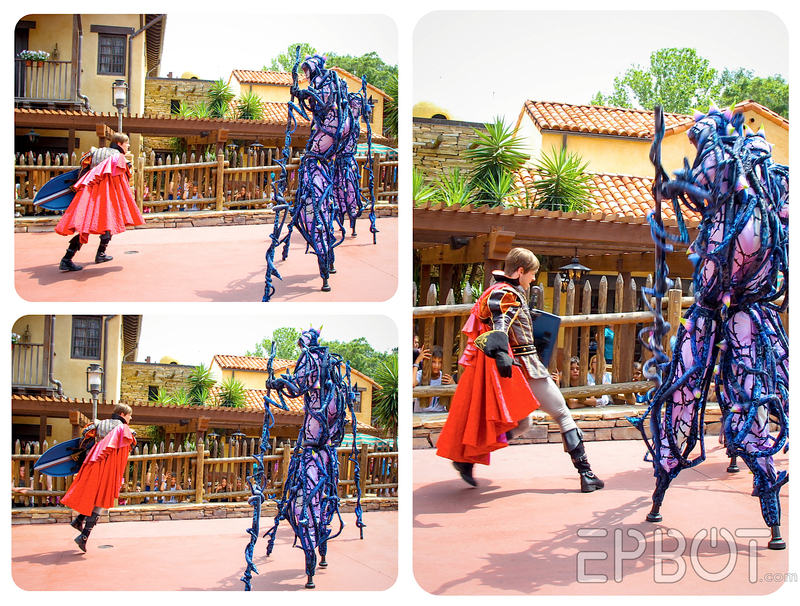 These costumes are a really cool way to bring Philip's battle through the thorns to life. And once he's "vanquished" all the Thornies, iiiiit's SHOWTIME! And I promised you a little fire action, didn't I? 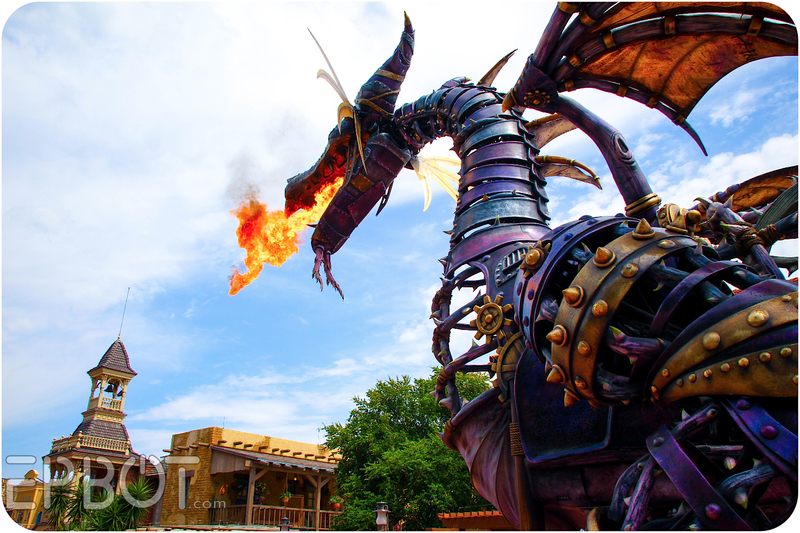 This also gives you a nice idea of the dragon's massive scale. 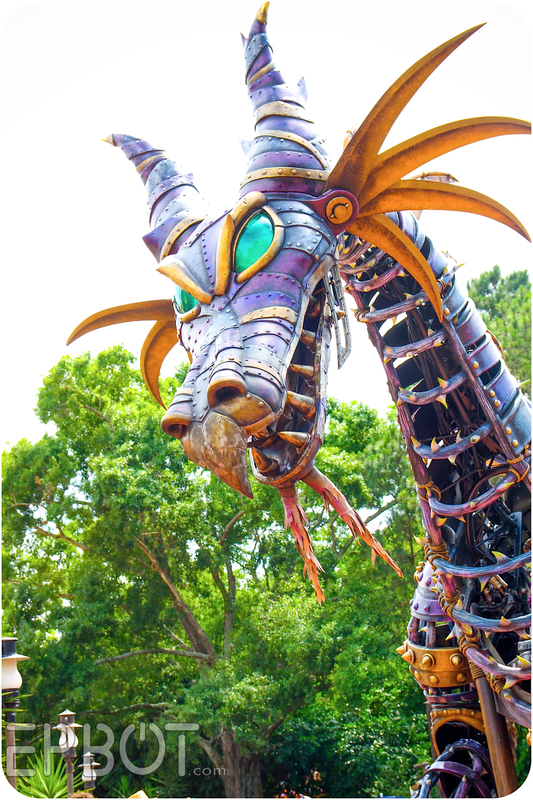 The dragon's legs move with the wheels, giving the impression that it's walking, and the massive neck and head have an impressive range of motion. 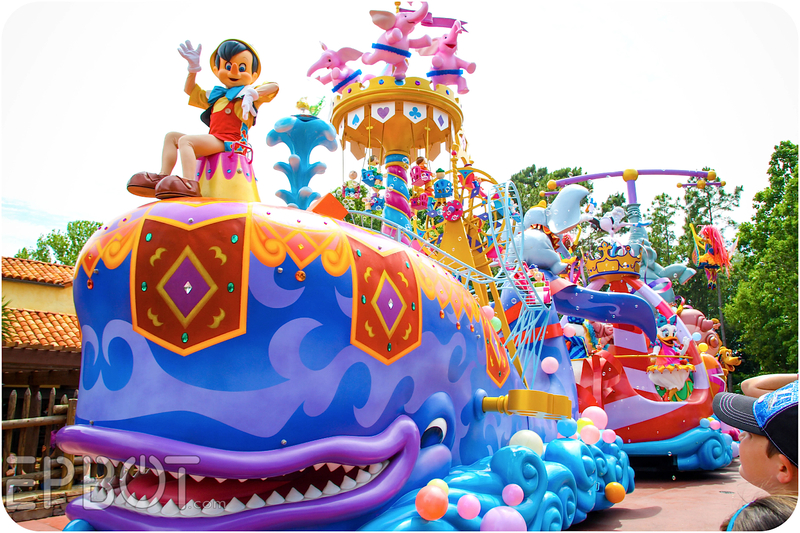 I've read that all the parade floats (and many of the street characters!) 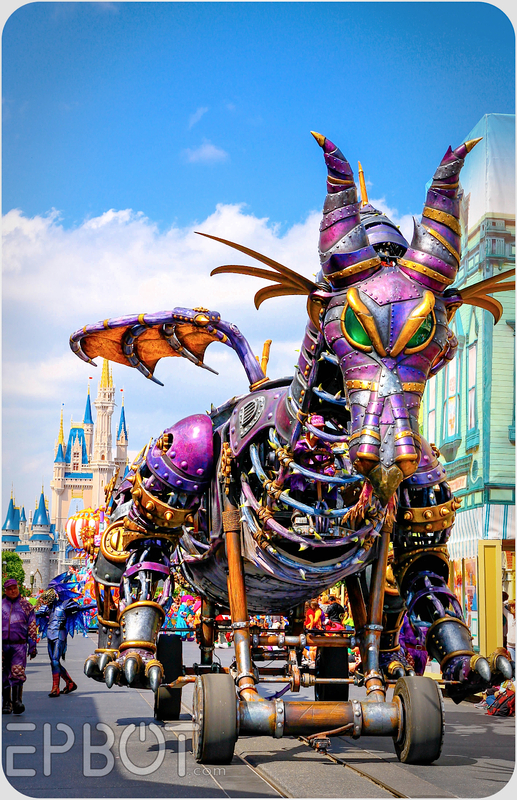 have at least one hidden Mickey on them, btw, and that Maleficent's is on one of her back legs. 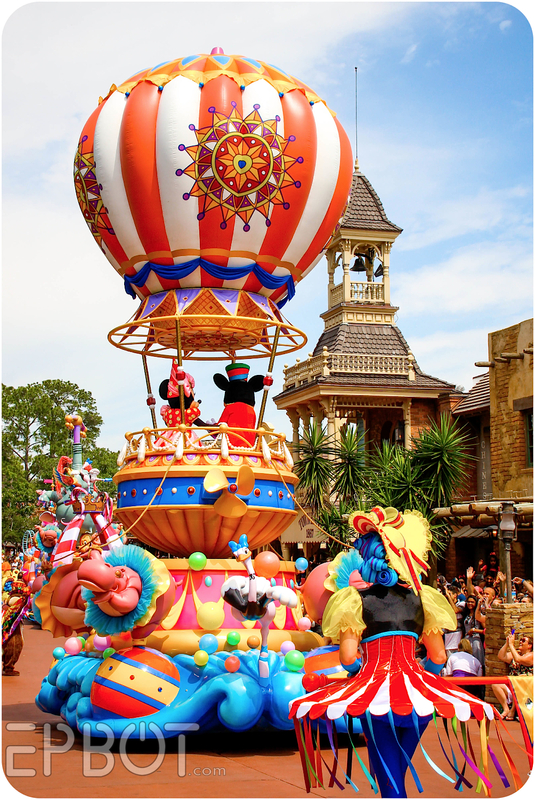 Considering how big the floats are and how quickly they fly past you, though, finding them all is going to be a challenge! See the talons? The boots are stylized bird feet! Ok, pick that jaw up off the desk, folks, 'cuz we're not done yet! Here comes the whole gang! 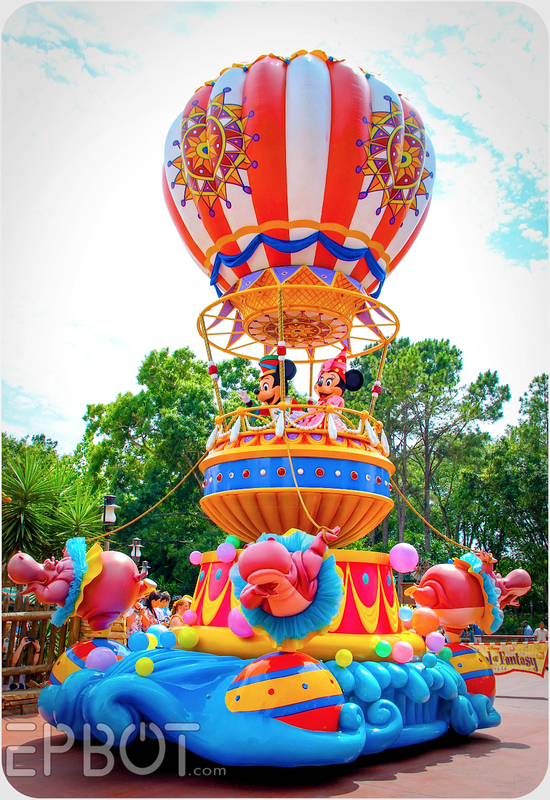 Apparently they sometimes arrange the balloons in their back bows into a hidden Mickey, but I didn't see one this time. These ladies have perfected the art of the sassy flounce, and I love it. 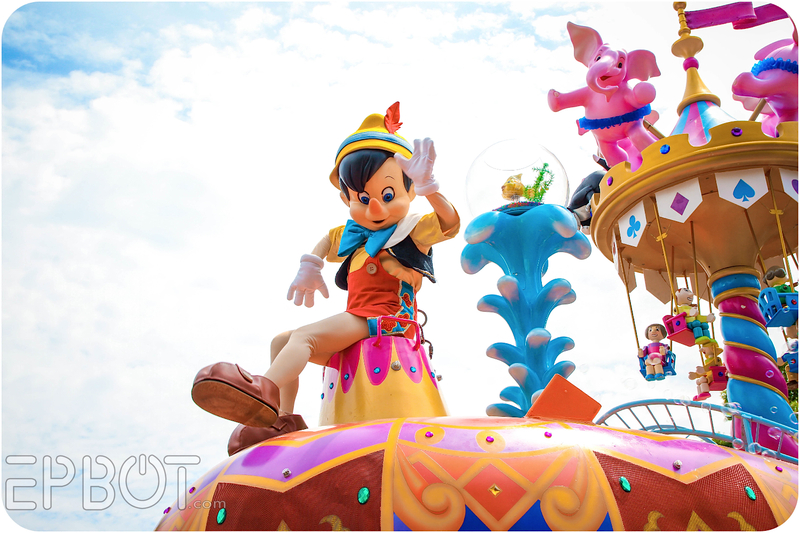 Next, the second massive float brought over from Tokyo DL: a three-parter celebrating Pinocchio, Dumbo, and Fantasia. The little Ferris Wheel and swing set spin, along with the wind-up key in the side of the whale. 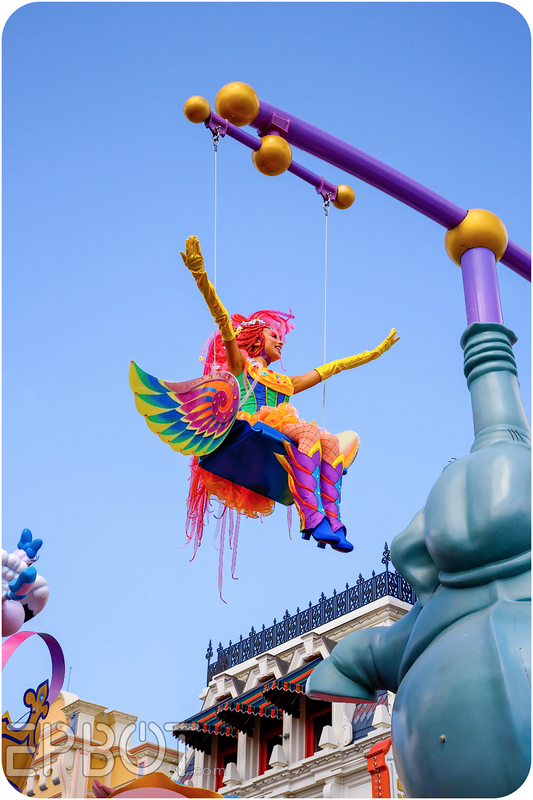 The characters in the swings are pretty hard to see as the float gets closer, since they're directly overhead. 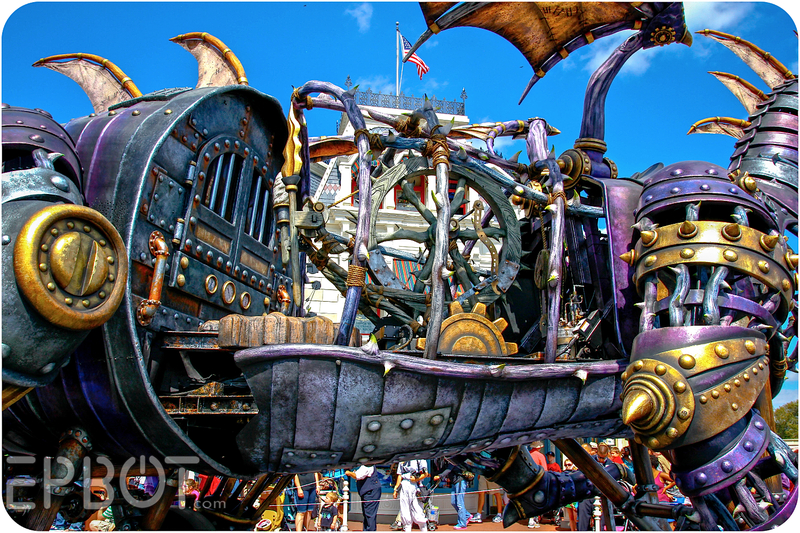 I didn't get any shots of them at all last time, so these pics are from Main Street again. 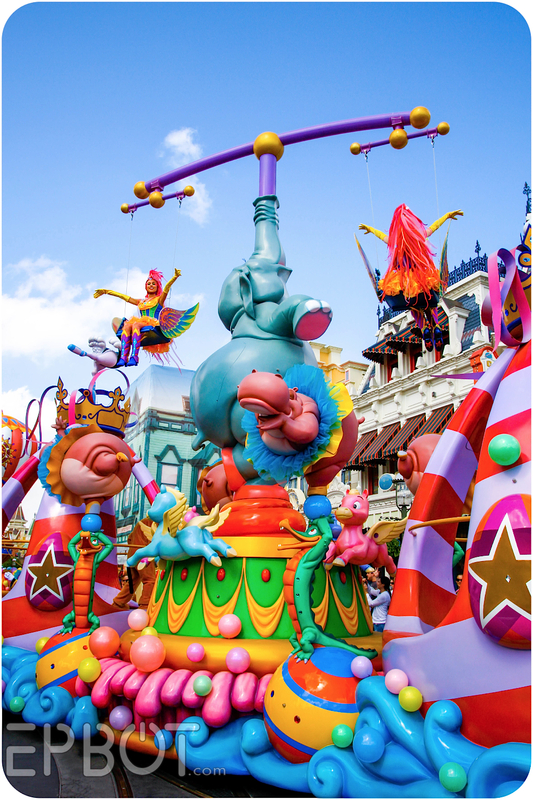 Which brings us to the big finale float! Congrats to Rose Dolphin, this month's art give-away winner! Please e-mail me your mailing address, Rose, along with your choice of prize from my Pinterest give-away board! Love the pictures! How do you get the colors so bright? We just got back from a trip, and your pics make me want to visit again immediately! 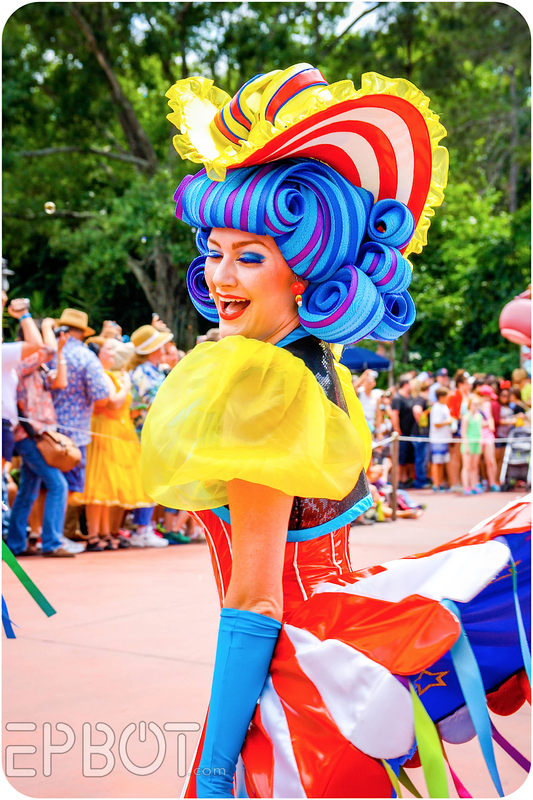 Where you say that the balloon-skirt girls sometimes have hidden Mickeys, there appears to be one behind the girl all the way to the right--Mickey's head is yellow, and his ears are green. Could be a coincidence; I'd imagine with balloons it's easy to spot things that weren't necessarily intended. YAY! Congrats Rose! Enjoy your pic/s! 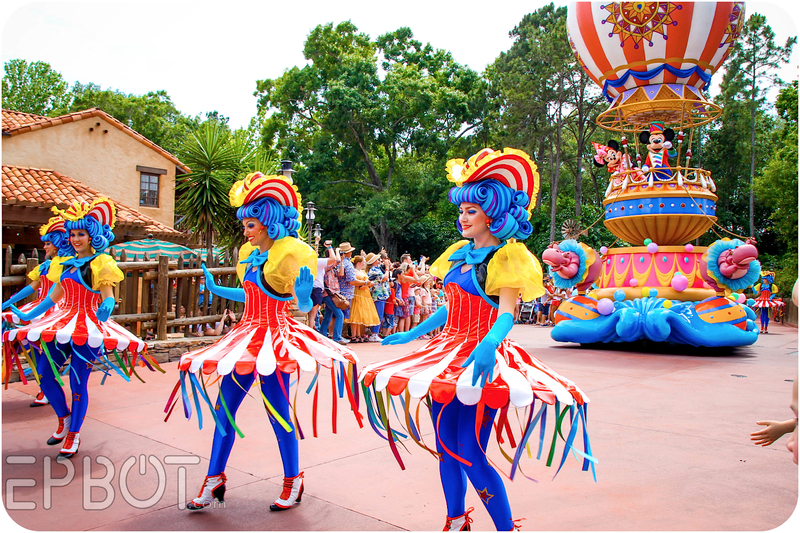 I think I see the hidden Mickey in the picture of the four balloon girls. The girl closest to us has a yellow balloon with 2 green ones on top. Maybe? Wow! These are gorgeous pictures, Jen! They'll have to keep me company until I can go back, again (prob. not for a number of years). Thank you for sharing and great work on the photos themselves. BTW - The costumes for the thorn bushes are such a great detail that no one but Disney would think of. Well done! Wow -- did not get tired of seeing those pics even after three postings. 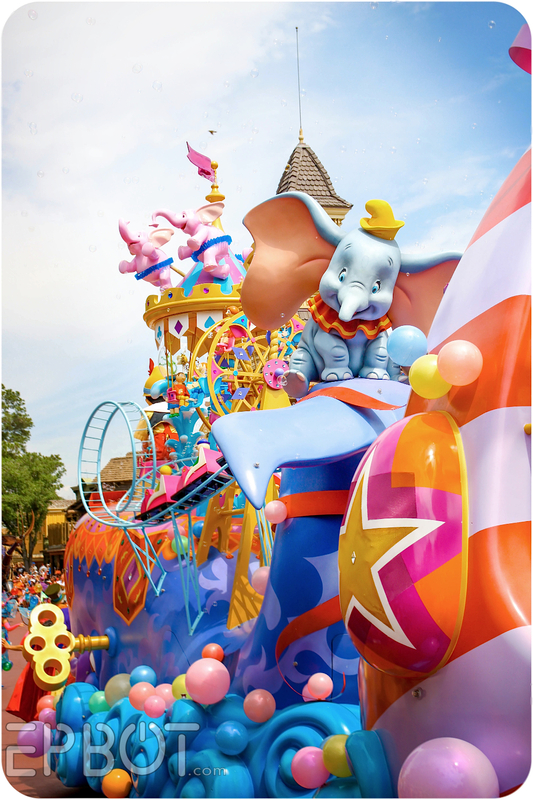 I've always wanted to see the big parades in any Disneyland resort. I haven't been to one yet -- yup, that's right. Maybe some day. What a strange but wonderful fun and creative job those performers have! I really like that they seem to be enjoying the heck out of themselves. that parade looks AMAZING! the costumes are sensational. we will be there in August. I love how you've intensified the colors. I ADORE the pictures! I'm sure your editing muscle is spent with exhaustion but I always love your story telling with pictures, love the new richness that is in them. 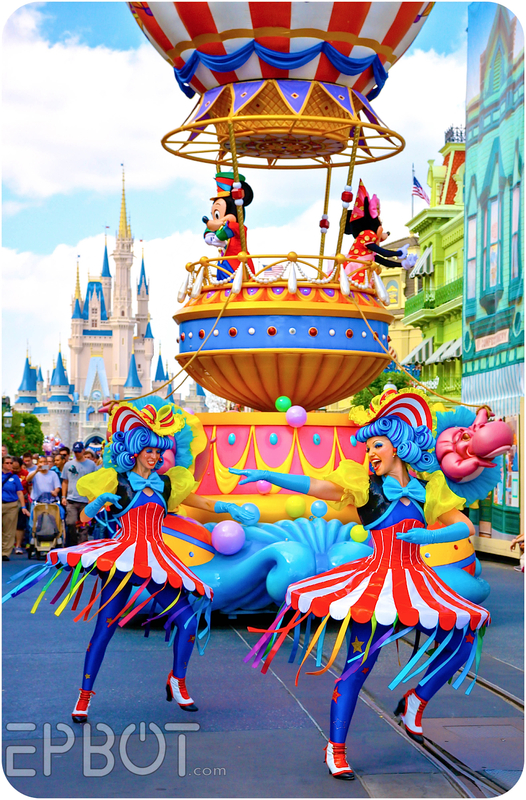 How cool would it be to have a job at Disney helping to design the parades, floats, and costumes? This is just so full of awesome!!! 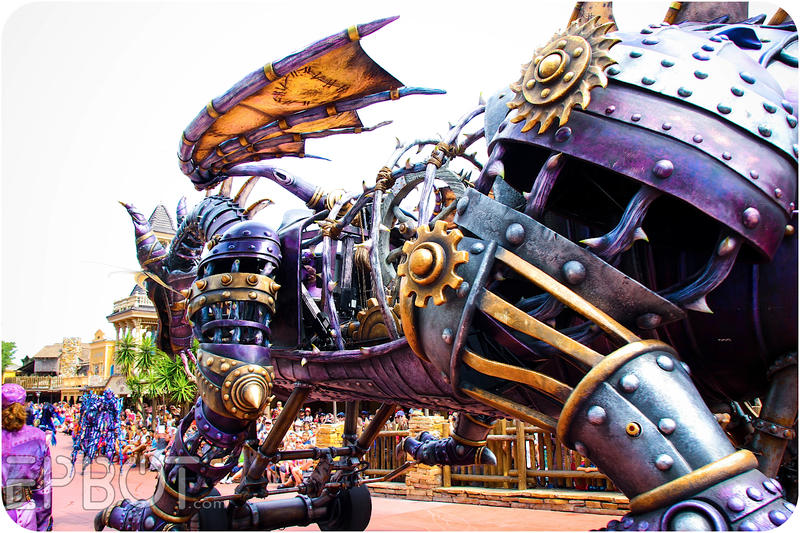 And the Steampunk dragon is just the icing on the cake. Thanks for posting all the cool photos! Thanks for the wonderful photos Jen! I'm glad you enjoyed it! 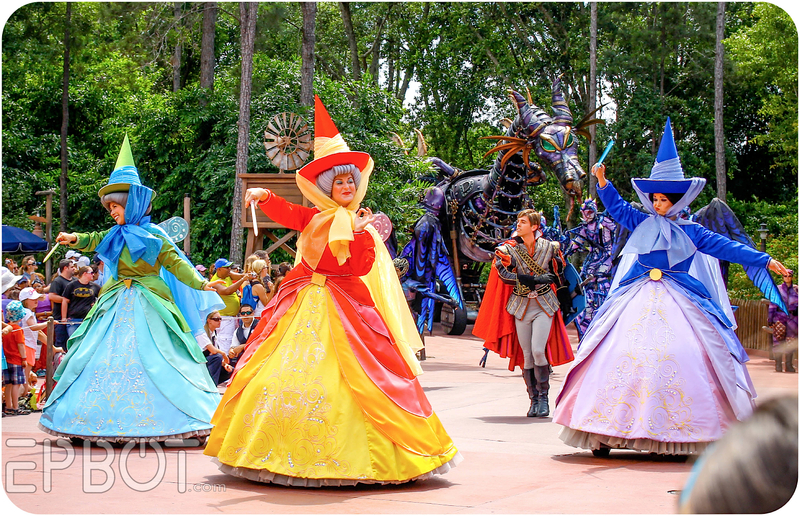 I work as a costumer on this parade and it is lovely to see such beautiful shots of the parade I've worked so hard on! 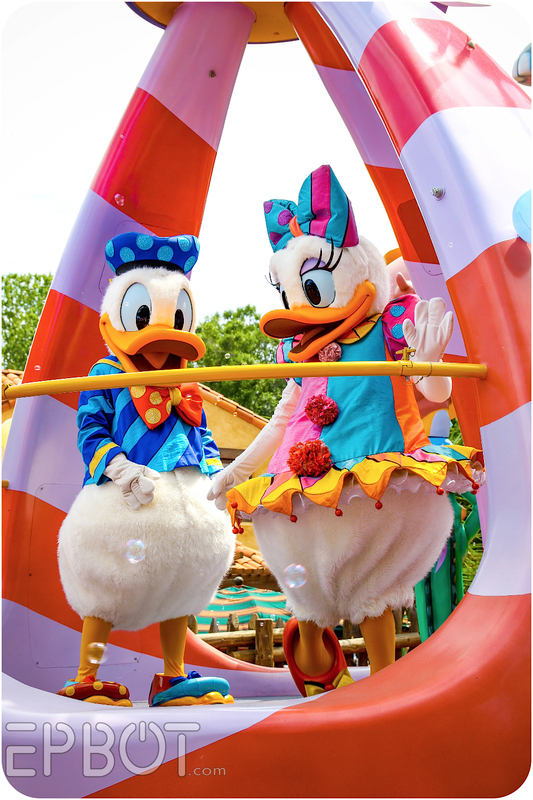 I hate to burst you're bubble on the bows for the 'bubble girls' but the bubbles are totally random, no intentional hidden mickeys there. 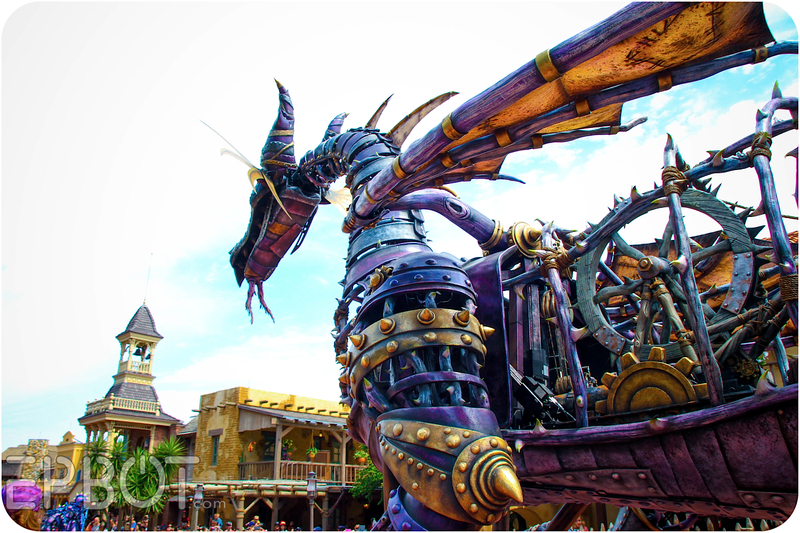 There is however another one on Maleficent. It's actually on one of the cogs for the spinning wheel. I know because I've seen it up close. 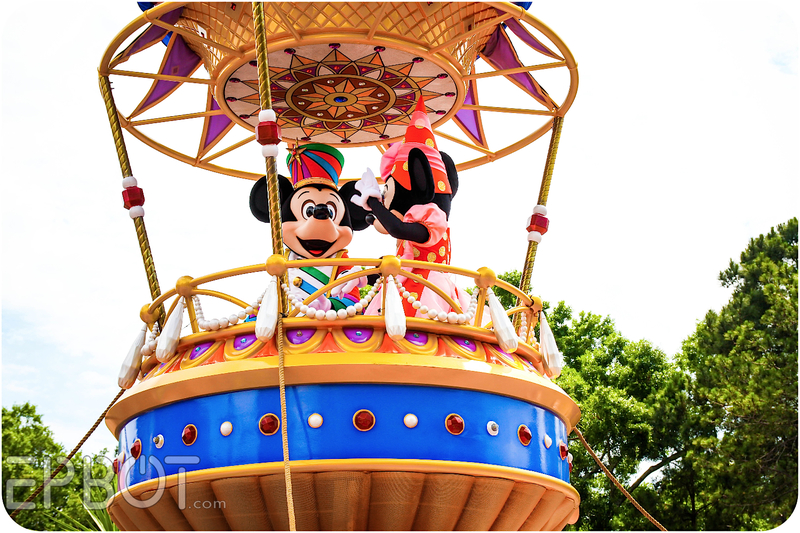 I can tell you a few more hidden mickeys on some of the other floats as well so you can look for them next time if you like. Ariel has two. One is made up of the purple shells on the back of the float and the other which, really hard to see is on the jewels on the bottom. It's on the left side if you are facing the float. 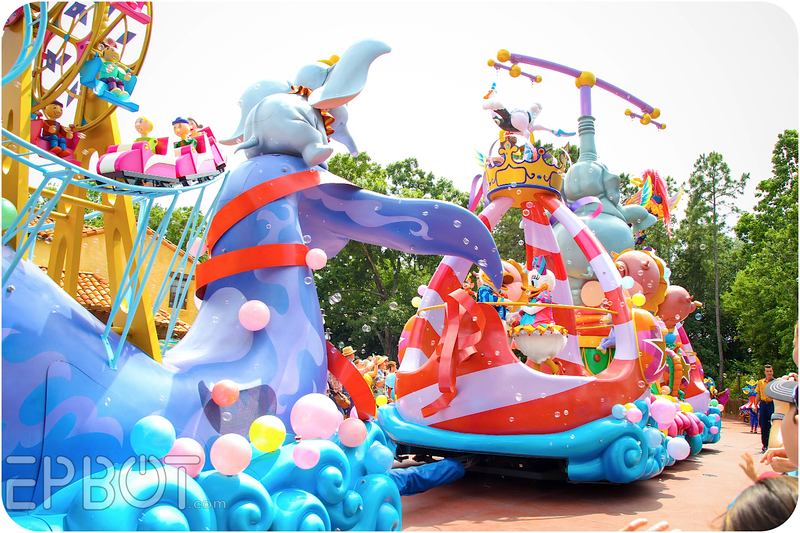 The Fantasia float has some of the bubbles on the side in the shape of mickey too. I have been enjoying these parade posts so much! The colors and happiness captured in these photos have made me smile and just brightened my day. I live just north of you and haven't been to Disney in a few years. 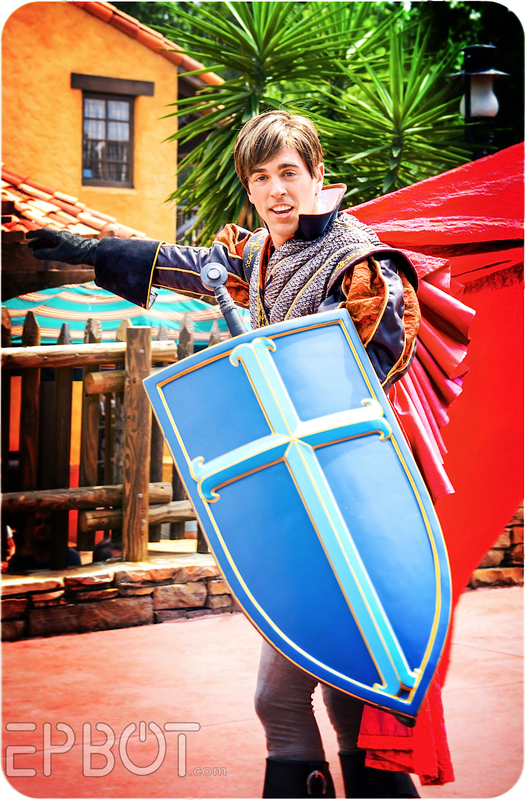 Maybe it's time I take a low key trip back to enjoy all these wonderful parts of Disney you've captured so well. First time poster, but have been reading since the beginning. Keep it up Jen, you rock! SO fantastic! Love ALL the photos from all three of the parade posts! Thank you so much for giving us this beautiful gift, Jen! 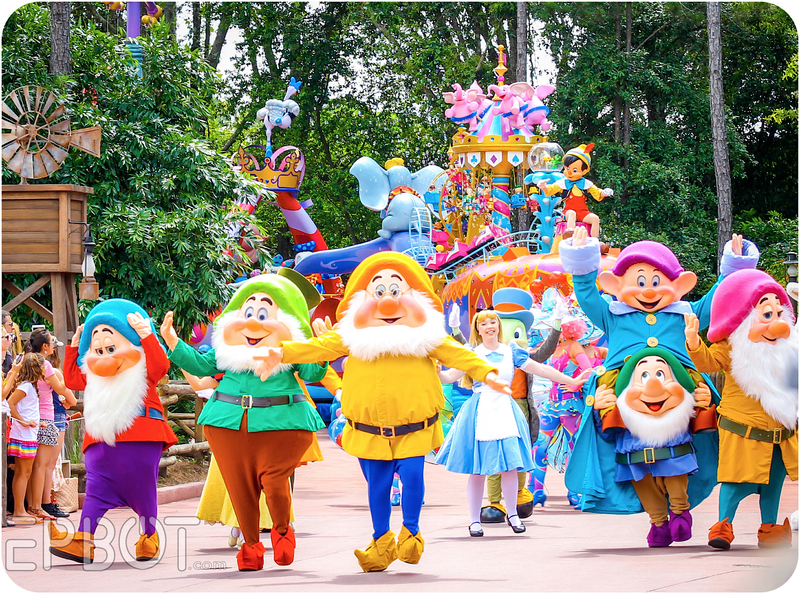 Can you tell us your secret to getting so many of the parade characters to pose for you? Do they actually stop and pose, or are they moving constantly while you're clicking the camera nonstop and you just happen to catch them exactly when they make eye contact? Or does John flag them down and get them to walk toward you? I can't even imagine the skill it must take to focus and shoot that quickly and perfectly. 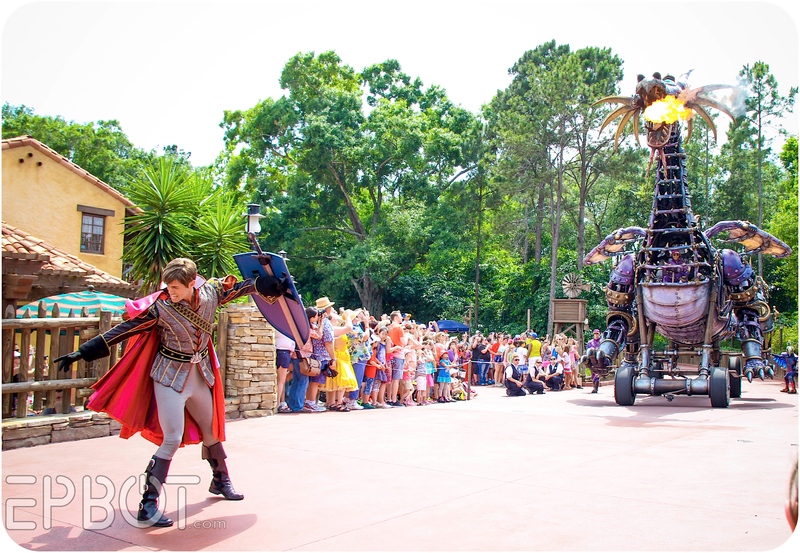 The costumes and floats are all spectacular, so congrats to anyone reading the comments (including Anna G above) who worked on the parade for your beautiful achievements. 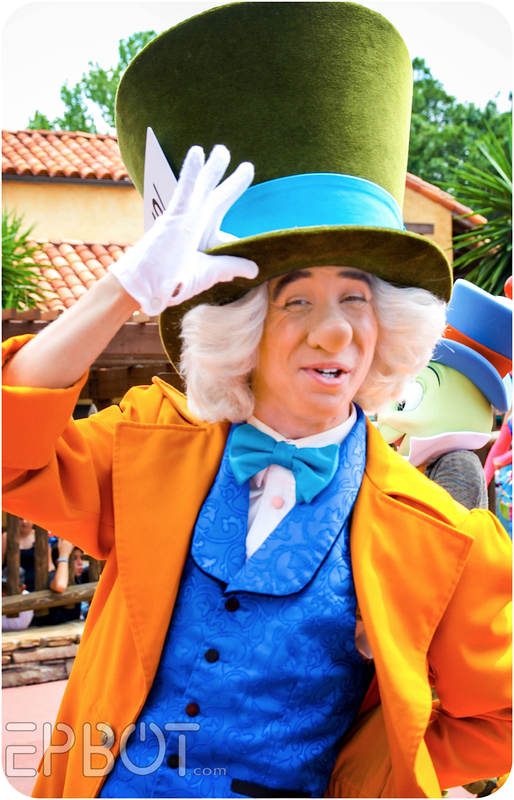 I want to go to the Magic Kingdom so badly, but my husband is not into it at all, and my son is only mildly interested. Sigh. I need a friend who hasn't been in a long time, like me, and who is super excited to see it all again. Anyone? Anyone? Sometimes if the characters see your camera up in that split second they WILL look directly at you, but usually they're just hitting poses aimed at the entire section of crowd. Wow! 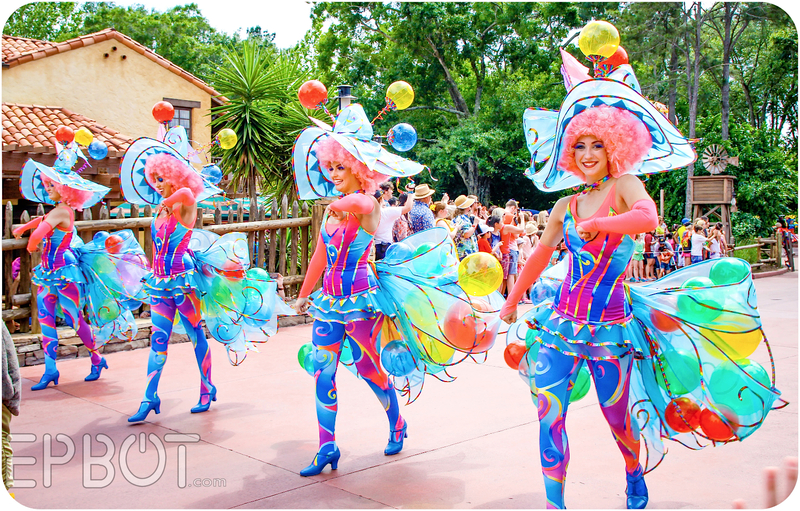 I love all the different costumes like the balloons and circus tents! I have never seen any like that! So amazing! 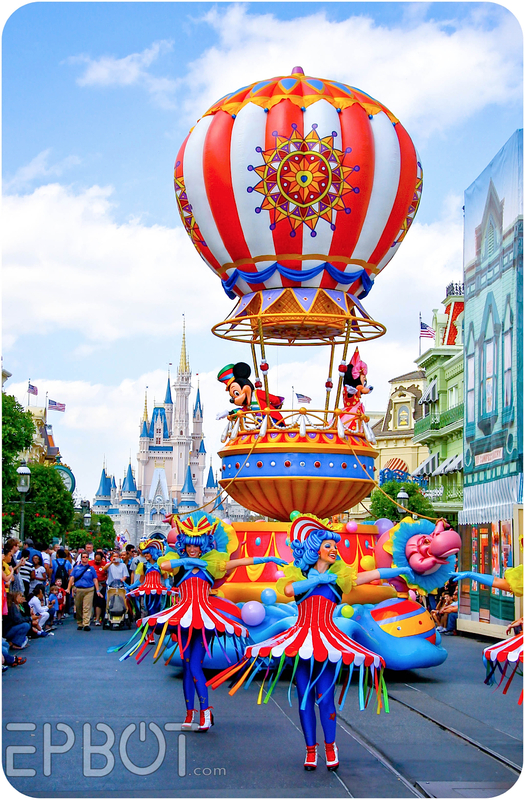 I really need to go to Disneyworld one day! My husband and I are going to Disney this fall- just the two of us. He doesn't really care for parades, and I've seen several there already, so I wasn't planning to look out for this one either. I may have to change my mind for this. It looks amazing, and your pictures are beautiful! Hey Jen, I don't know if others have mentioned this, but for the last few days (weeks?) the photos on your posts are taking ages to load! Are you using larger image files than you used to? I don't know enough to know if it could be a bug with the blog site/system, but it's only happening on this page (for me). Did they take out the chimney sweeps? 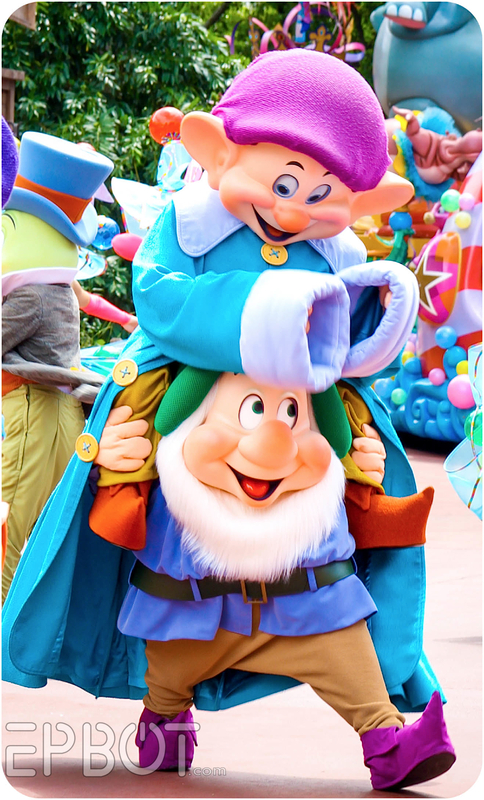 They have always been my favorite part of the Disney parades! All the female actors and characters look like drag queens. 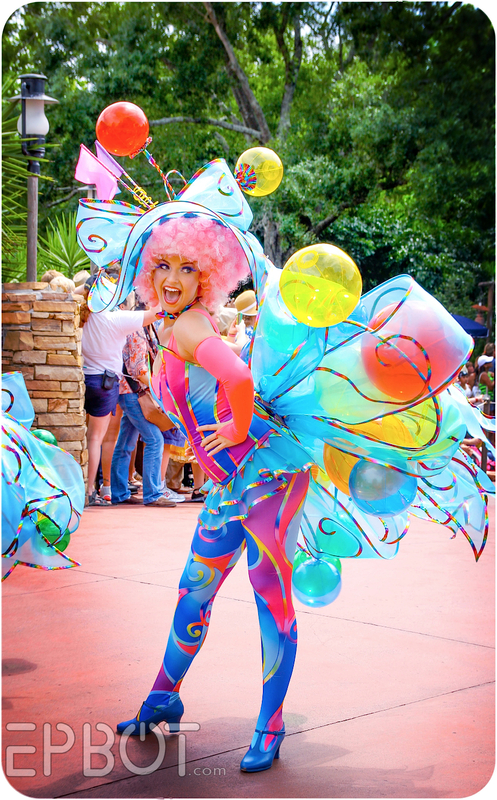 Thanks for posting these, I love the costuming and colors. Hi there! 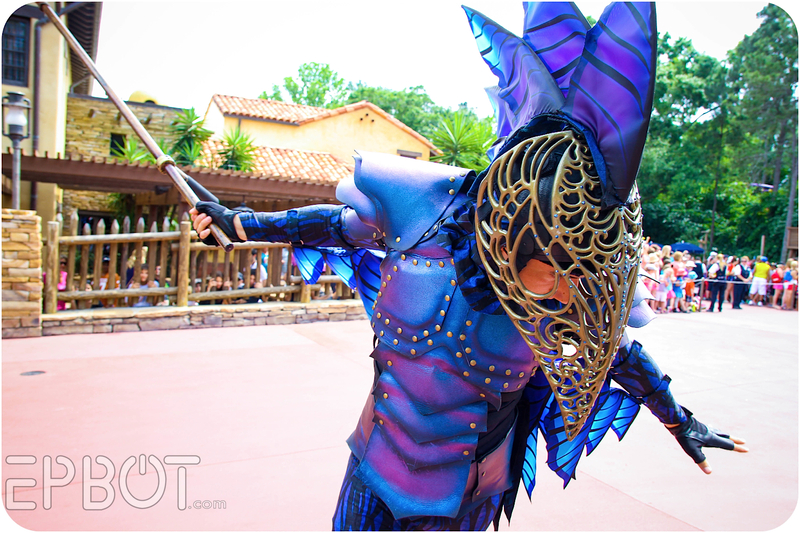 JediPixie here - The costumes for Festival of Fantasy were designed by the lovely and talented Mirena Rada. 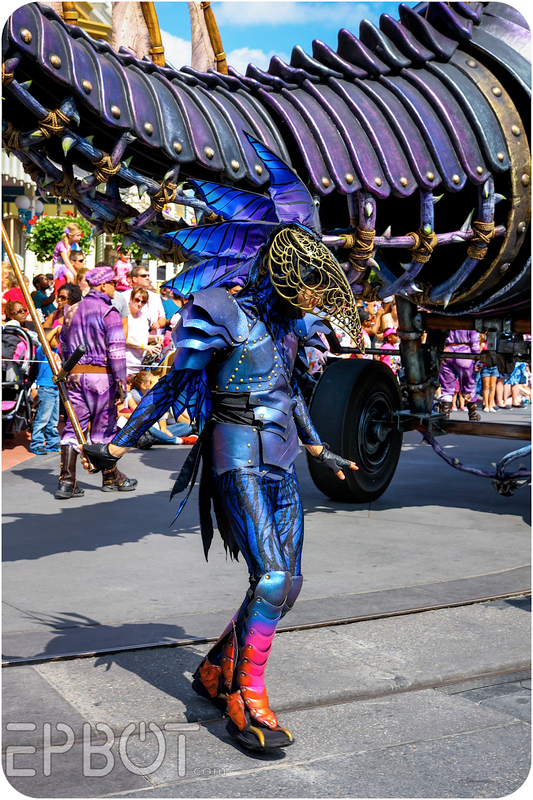 I was the Costume Design Intern at Walt Disney World while the parade was being created and was lucky enough to work with Mirena and the rest of the team. I'm so thrilled to have been just a small part of the parade and being able to learn from Mirena was a once in a lifetime experience!